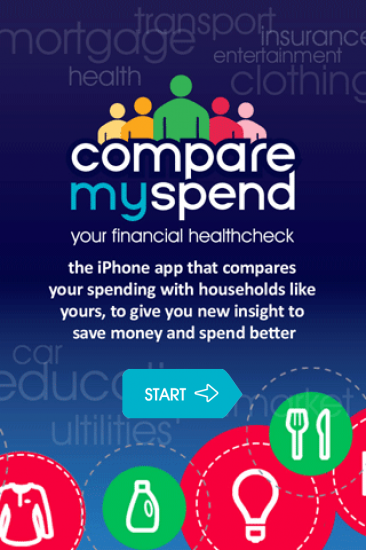 If you are trying to save money AND you are a right nosy parker, come closer: I want to show you a fancy new app called Compare My Spend. It takes your spending habits, then compares them to the average spending habits of other people like you, highlighting areas for improvement. 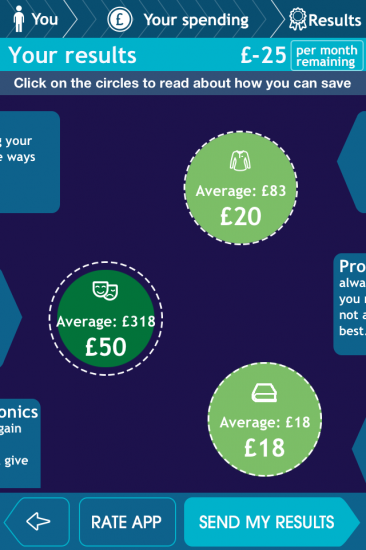 You can also get the background stats for each category, along with tips for spending less. Disclosure time: some of those tips were written by me. The very nice financial whizzes behind Compare My Spend contacted me towards the end of last year and asked if I would contribute. I’m so happy to see that the app is finally finished and is now in the iTunes store, where it is free (hurrah!) and is getting deservedly good reviews. It is a really smart tool – especially if, like me, you are as nosy as Mrs Mangel interested to see how your own finely-tuned budgeting compares to the “norm”. This free app is like a personal finance version of keeping up with the Joneses – except that you want to be scoring less than your neighbours, instead of more. 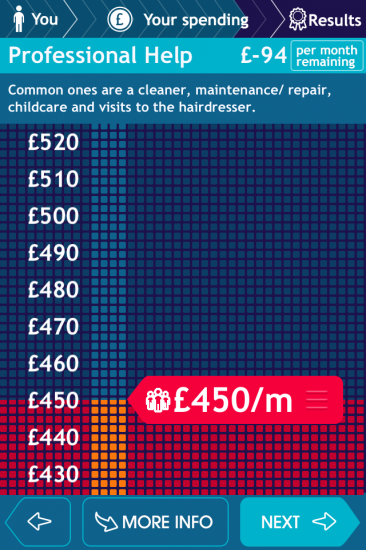 You begin by telling Compare My Spend how old you are, where you live, the size of your income and the size of your family. 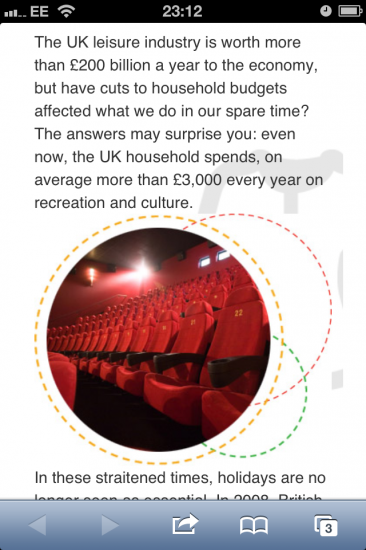 This information allows the app to compare your expenditure to the average expenditure for people in your position. 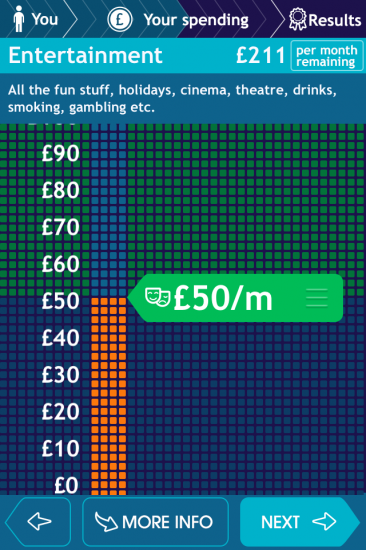 Then you tell the app how much you spend in each of its categories, by moving the arrow up and down with your finger. If the arrow stays green, you are spending less than the average in this area; blue, you are smack bang in the middle of “normal”; red, you are spending more than the average and could be making savings somewhere. 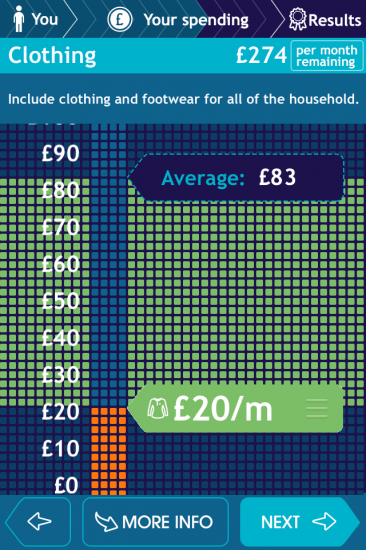 You can also press the More Info button for additional information about the category, and UK spending habits. After you have told the app how much you spend in each of the categories, it brings up your results, along with some pointers and tips for improvement. As you may surmise from the above screengrab, with all its lovely big green bubbles, a frugal lifestyle makes you a total swot at this. But when you are used to living frugally, it’s easy to lose perspective. I was interested to see how far below the norm my spending (or lack of it) fell. 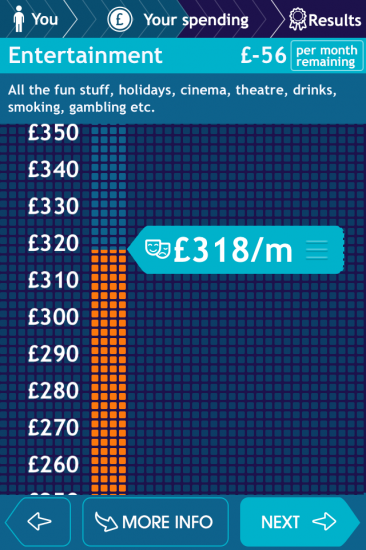 So my average peer spends £318 a month on entertainment and holidays? Really? That’s more than £10 a day! Ah, that is more like it! And look at that. SWOT! I can see, at a glance, how my charity shop and eBay habits are – quite literally – paying off. I didn’t score green in all the categories though. Before you ask: no, I don’t have a cleaner or an expensive hairdresser habit! This is how much I spend on childcare every month. 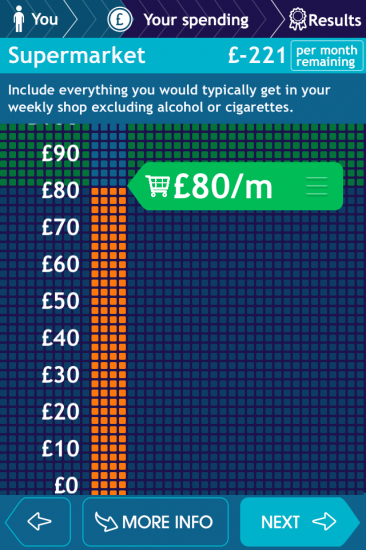 The Compare My Spend app provides a fairly silky-smooth user experience. It isn’t perfect, but then I think there are always going to be small niggles because when everyone is different, a one-size solution doesn’t always stretch to fit. For example, my relatively high Professional Services expenditure was flagged up with the advice to shop around for a few quotes for “any work that needs doing”, but sending a child to nursery isn’t really the same as getting a plasterer in! I’ve never seen anything like this but I have to say, it’s a pretty clever app… Well worth a try! This app looks wonderful – I will have to give it a test run! That sounds pretty neat! I love hearing about other people’s finances (like on the Suze Orman show, reading blogs, etc. ), so this would be a way to do that as well. Oooo thrift and snooping – my two favourite things! Can’t wait to try this out, Miss Thrifty. I have an awful feeling that it might take up quite a lot of my time in the coming week – just looks way too addictive. I think they should put a button on it to calculate the amount of money people lose because they’re too busy playing with the app to do any real work. Got a feeling I’m going to fall into that bracket for a good while . . .